Historical Mile 797 Nsultin Bay Bridge, longest water span on the Alaska Highway. 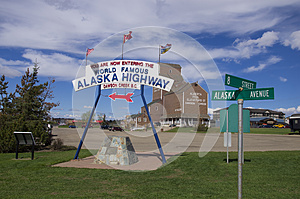 Teslin has a population of approximately 450. 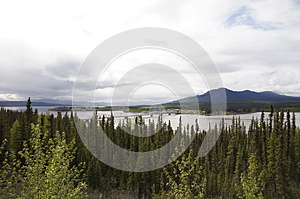 The name Teslin is taken from the Tlingit word Teslintoo, meaning, “long narrow water”. Teslin Lake is 92 miles long. 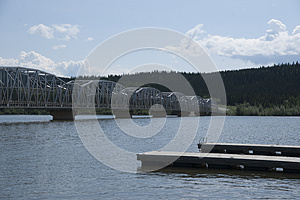 There is a Day-use area, picnic tables and boat launch at the north end of Nisutlin Bay Bridge. 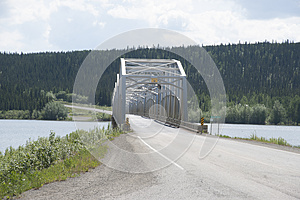 The Nisutlin Bay Bridge is the longest water span on the Alaska Highway at 584metres/1,916 feet. In the late 1800s gold seekers traveled up the Stikine River from Wrangell, Alaska, then trekked 150 miles overland from Telegraph Creek to the headwaters of Teslin Lake where they constructed crude boats. 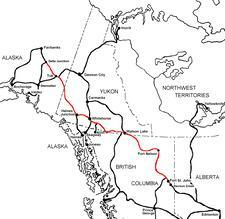 Then they sailed over the lake and down the Teslin and Yukon Rivers to Dawson City and the gold fields. The first known permanent settlement of Teslin was in 1904 when a trading post was established to serve the Tlingit Indians. Teslin’s economy is still based on traditional hunting, trapping and fishing, although tourism is playing an increasingly important role. 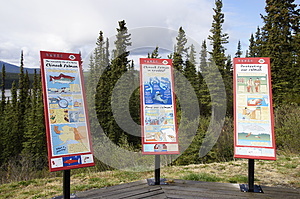 There are several businesses in Teslin that cater to the visitor. Teslin is also home to The George Johnston Museum; an amazing collection of photographs and historical memorabilia. 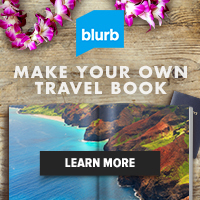 � Photographer: Robert M. Braley Jr.